Score one for the residents of Philadelphia as their newspapers appear to be the first in the country to catch up to the 21st century. Philadelphia Media Network Inc. (PMN), owner and publisher of The Philadelphia Inquirer, Philadelphia Daily News and philly.com today announced that they will begin selling a subsidized tablet with subscriptions to their news apps. 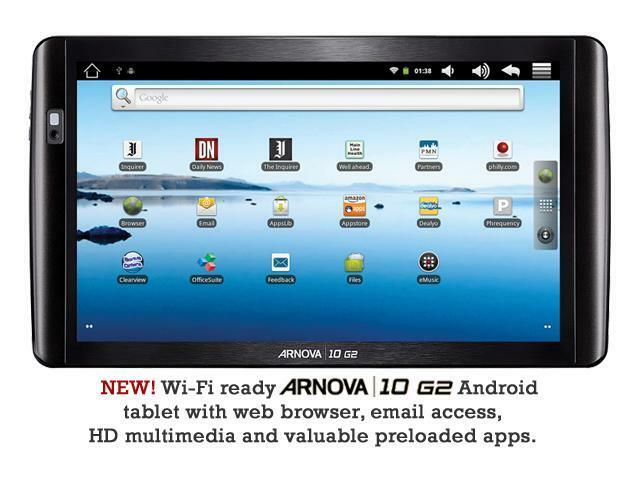 The Arnova 10 G2 Android tablet is a fully functioning Gingerbread tablet that comes with apps pre-installed for all of the company’s news publications. All of the details of the deal can be found at www.phillytablet.com, but it boils down to you receive the table for $99 if you agree to a two-year subscription to the apps at $9.99 a month, or $129 with a one year agreement at $12.99 a month. Assuming you go for the former, that works out to a grand total of $338.76 … for a tablet that retails generally for $199 or less. True, you are getting subscriptions to the apps at a discounted rate, but that is still a fairly large bill when you look at it over the time period of the agreement. I have actually been a big advocate for a few years now that newspapers should give away free e-readers with subscriptions as it would cost them less in the long run for a number of reasons such as printing, ink, delivery and so on. No one has gone quite that far yet, and while this deal is far from being perfect, it is certainly a step in the right direction. It is one that publishers are going to need to continue to explore as readers go more and more mobile in their daily lives and want news when and where they want it without seeking out a printed version of it. The tablets go on sale on Tuesday and are limited to 5,000 currently. Would you ever have any interest in buying a subsidized tablet or e-reader from a newspaper?